provides high quality, up to date epilepsy training in line with current best practice guidelines (previously Joint Epilepsy Council's guidelines). is essential for those working with or caring for people known to be at risk of having seizures. will facilitate best practice in a variety of settings and situations. is delivered by an experienced Specialist Epilepsy Nurse who is also a qualified teacher and experienced trainer and maintains professional registration and continually updates knowledge and skills to ensure all training is up to date and in line with current best practice. courses are delivered at your premises or any suitable venue. will be individually tailored and designed to suit your needs. courses are suitable for families, people with epilepsy, carers, teachers, nurses, health care assistants , support/key workers, employers and employees, social workers, youth workers, childminders and anyone with an interest in epilepsy or who supports a person with epilepsy. Our training will ensure appropriate and sensitive support, promote best quality of life and reduce risks for people with epilepsy. Optimum care and sensitivity for people with epilepsy and their families. Increased epilepsy knowledge and practical skills (i.e. first aid and emergency rescue treatment) relevant to client group and participants requirements. 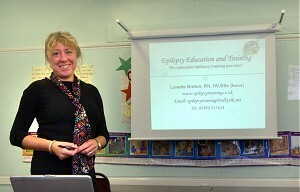 Courses appropriate for everyone with either a personal, professional or caring interest in epilepsy. Convenient and appropriate courses with supervised simulated practice sessions. Lynette is a natural instructor and has a lovely manner. Very knowledgeable trainer, most relevant informative training I have ever had, given me much confidence. Passenger Assistant - Somerset County Council.